Upright exercise bikes with backrests is not something that you see too much of. Except for the folding exercise bikes that do come with one in most cases. They are more common with recumbent exercise bikes which are known for being more comfortable due mostly to the seat and back rest. But as well as the folding bikes there are now some other upright exercise bikes that have introduced back support. They are new, so it is yet to be seen at how well they stand up to the test of time being used in people’s homes. This is an unusual looking upright exercise bike. It doesn’t have the front post with the console and handlebars that you normally see. It has a padded and contoured seat along with a padded backrest that provides good support that also helps with the balance too. The seat has a standard bike fitting so it can be replaced easily if you don’t like it. The big advantage of the bike is you can work while you exercise to help with your overall fitness and health. This bike can fit under desks or tables with a minimum height of 39 inches. It has 8 levels of magnetic resistance that is manually controlled by the tension knob at the front of the bike. It has a belt drive and flywheel for a good consistent pedaling motion. It operates very quietly do can be use in an office or anytime without disturbing others. Customers like the seat and backrest on the whole, how steady and quiet it is and using it with an adjustable or standing desk. Read my in depth review here. While this is an upright bike that has a desk with it so you can work and exercise at the same time it does have something different. It has a large contoured seat and backrest to give good support, comfort and balance. The seat and backrest a fixed in relation to each other but they can be moved vertically and horizontally to help to get the best position for you. It can fit people between the heights of 5ft 1 ins and 6ft. It has a maximum user weight of 242 lbs. The bike also has 8 levels of resistance and belt drive that is quiet and provides a good consistent pedaling motion. In choosing the bikes I looked at bikes with a backrest to start with – obvious I know. After that I looked at the specifications, product listings, product manuals, asked questions of suppliers and where available read through customer reviews to see how the bikes worked it practice. I wanted to find bikes that also did a good job at providing low impact exercise as well as on the whole a comfortable and supportive seat and backrest. 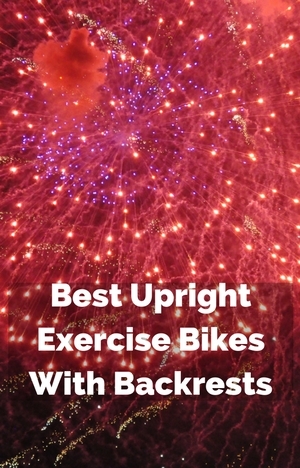 I also looked at finding bikes that while having a backrest they also provided variety – so that you could get a decent workout from the bike too. A backrest can certainly help with providing more comfort along with support and balance on the bike too. They do have bike type seats but the additional support seems to help with making sitting less painful. They tend to have less complaints about numbness and pain. Some of the folding exercise bikes may more rightly considered semi-recumbent as your legs are more out in front and down at an angle than you get with an upright exercise bike but most do find them comfortable. The level of resistance that these bikes provide is not going to suit anyone who wants very tough hill climb workouts and they aren’t designed for standing on the pedals. They are more for people who are beginners and those looking at moderate levels of exercise. It’s good to see there is now more choice being given so customers can get a bike they want to help them with achieving their fitness goals. Although there probably still a little way to go until they have something for everyone – with it tending to be limited to bikes with desks and folding exercise bikes in the main. I wish I could help. I don’t know of a backrest you can add to an upright bike. I think you are best talking to a bike shop to see if they can help. Sorry.